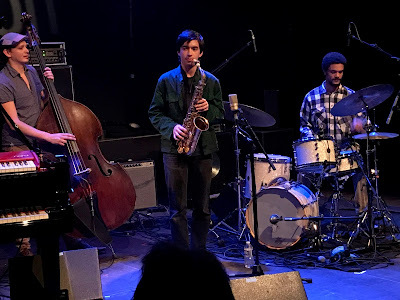 L-R: Thibault Cellier, Antonin Tri Hoang, Elie Duris. The Jazz Migration scheme is a highly organized way for jazz ensembles from France to gain exposure and to be heard nationally and internationally. This showcase presented the four contrasting bands who have been chosen to be supported by the scheme, with each giving a 30 minute set. The showcase was attended by an audience mainly consisting of domestic and international promoters and festival directors. It will be interesting to see which of the bands is able to make the most use of this chance to build its profile. Of the four bands, two featured musicians who have already featured on this site: firstly, Novembre has alto saxophonist Antonin Tri-Hoang who has toured the UK as a member of Jim Hart's Cloudmakers band (the vibraphonist described his special strengths in this feature); secondly, saxophonist and clarinettist Robin Fincker, while not a fully accredited full member of the band Ikui Doki, is clearly more than just a dep. 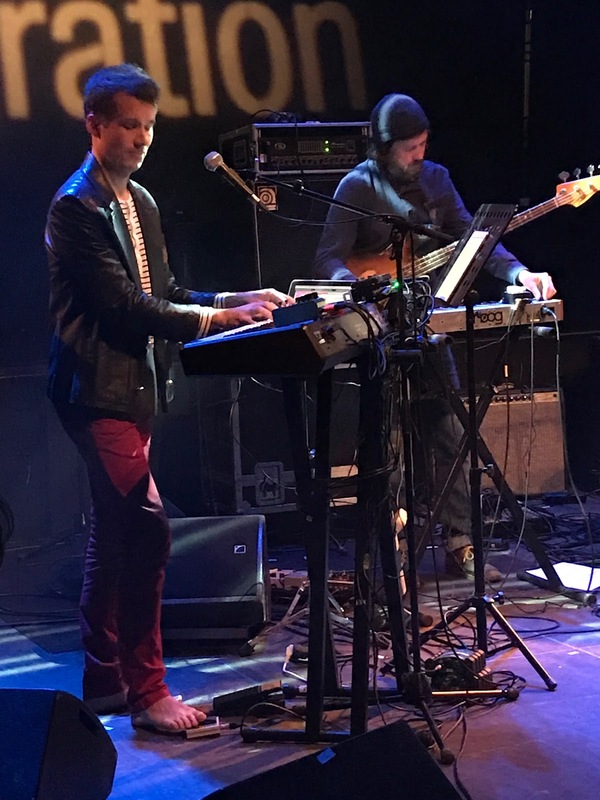 He lived for 11 years in London, where he was one of the driving forces behind the Loop Collective - he has been on tour with them and, for example, wrote most of the compositions on a fine 2012 album by Outhouse (reviewed by Chris Parker). Novembre is a saxophone, piano, bass, drums quartet led by alto-saxophonist Antonin Tri-Hoang. They launched into a full-on blast with jagged lines from the whole group followed almost immediately by a switch to a gentle piano-led passage. This was the pattern throughout the set: a series of tightly controlled short sections with rapid changes of mood. 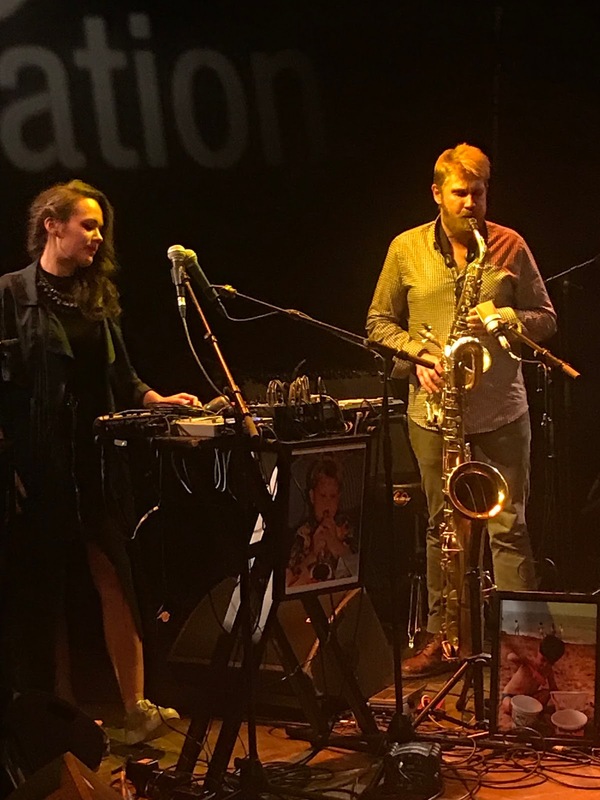 The music is composed, but uses the language of free jazz with influences from the composition style of Tim Berne and John Zorn. Listening online before the concert I worried that the constant changes might become tiresome, but in the live performance - played impressively from memory - it all worked really well. This trio had a wide expressive range. They were capable of being the most quietly reflective of the four, and yet Rafaëlle Rinaudo uses her harp very percussively with mallets and amplification - in fact she was asked earlier this year jokingly in an interview “You really want to hurt the harp....is that why you hit it?” Hugues Mayot on baritone saxophone was interested in percussive reed slaps and also the skronkier end of the low horn's sound possibilities. The band's musical influences range from Debussy to German 1980s industrial music, and in their allotted half an hour they satisfyingly traversed all kinds of moods. Not what anyone was expecting, I imagine. 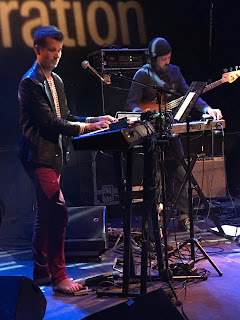 Pianist Armel Dupas stood bare-footed at an electric piano and started delivering the most easily approachable music of the evening.... something which risked subsiding into the mushy area between Einaudi and e.s.t. 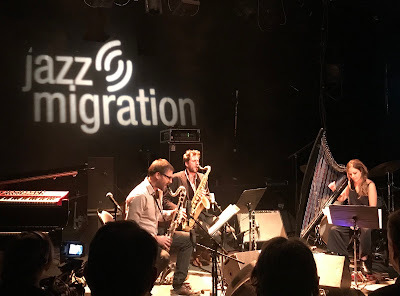 Things then got more interesting, not least because drummer Mathieu Penot was serving up all kinds of cross-rhythms and intensity builds. An interesting player capable of injecting all kinds of energy and musical interest, and also occasionally to take over and dominate. An intriguing act.